This was our 3rd choice of the evening, as the first was out of business, the 2nd wouldn't accommodate us as a couple at a table for 4, so granted, went in with less than positive attitude. But I believe I am being fair in this review, after thoughtfully reviewing our experience. Plenty of seating, plenty of servers, and fast food service. Very complete salad bar, though it is not automatically a part of all entrees, and is 4.99 by itself, which I think is a bit much. Ordered the ribeyes, and I had the shrimp added with mine. Both steaks were overcooked, and my 12 oz. was one third fat, not including the marbling. My steak was also rather tough compared to other steaks I have eaten, including the sirloins at Golden Corral. They food was hot, which I really appreciate. The sweet potatoes were good, not microwaved. The Texas toast was a bland buttered, just slightly larger slice of grocery white bread. If you name your place a steak house, you should have a better product. I wish I had ordered the liver and onions, which were probably fine. 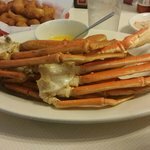 Hey we have recently moved to Calabash, NC recently and today we ate at your restaurant. Let me just say, "Job Well Done!". The buffet at lunch was excellent and I fell in your love with your fried chicken. The fried okra, SPECTACTULAR! The stewed apples, delicious! Really, it was all great! I have never had strawberry cobbler, but y'all had it, I tried, and I loved it! However, the thing that made the meal extra special was your employees Lade who stocked the bar and Willie who cleaned dirty dishes off the tables. I don't know how much they get paid, but it ain't enough. Ladel was so sweet, friendly, and nice and a font of imformation about all the foods. She treated us like her friends, not just customers. Please tell her THANK YOU from the Smiths'! Then Willie was all over that restaurant like a flash. You could barely set your dirty dishes aside and they were GONE! The guy was amazing! Please tell him JOB WELL DONE too! Anyway we will be back! Regularly! Thanks! Been to Jerome's Steak & Seafood? Share your experiences!